Following the overwhelmingly positive response from customers after McLaren took a P1 and reimagined it in exposed carbon fiber, the company has decided to do the same again, this time to a 675LT Spider. However, don’t think it’s a carbon copy. 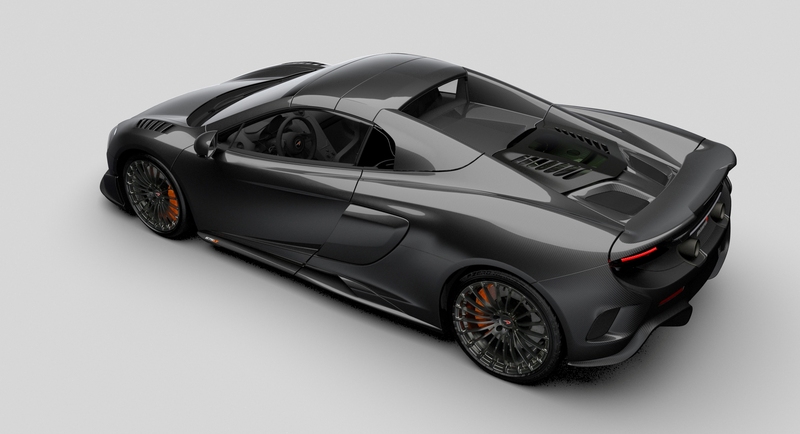 Unlike the P1, which was simply a design exercise showing the company’s growing client list what its bespoke arm — McLaren Special Projects — is capable of doing, the MSO Carbon Series LT, as it has been christened, is a true production car and one that’s guaranteed future classic status, thanks to being limited to just 25 examples. Carbon fiber has earned its reputation within the automotive industry due to the fact that it is exotic, stronger than steel, and yet extremely lightweight. All of which makes the 675LT Spider the perfect choice for the treatment. After all, this is the car in the company’s super series that has already been shed of as much weight as possible in order to deliver monstrous track performance. Much of the car is already sculpted from this material, but the Carbon edition takes things further still with a carbon fiber roof and tonneau and even a carbon fiber fuel filler cap — in all there is 40% more carbon fiber in the build. And while it is usually hidden under a mirror-finish paint job, for the new model all of the carbon fiber is fully exposed (so the weave has to be millimeter perfect) and covered in a high gloss finish. Other details setting it apart from a ‘standard’ limited edition 675LT Spider include front wing louvers and three integrated cameras for capturing track action as part of a Track Telemetry pack. One item that remains untouched in the new model is the engine. It’s still 3.8-liters, it’s still a V8 and still has twin turbos and when spooling gives the car 675PS (that’s 666bhp), a 0-100km/h time of just 2.9 seconds and a top speed of 326km/h (203mph). As well as announcing the new car on Tuesday, McLaren also claimed that every single model is already pre-sold even though production won’t be starting until the fall with the aim of delivering each car to its owner in time for Christmas.